Like René Clément’s “Forbidden Games,” British director Brian Percival’s The Book Thief focuses on the effect of war on children who are forced by circumstances into coping with events beyond their capacity to understand. Written by Michael Petroni and based on the novel by Australian author Markus Zusak, it is a story told with power and conviction about the Nazi’s systematic attempts to destroy learning and culture in Germany during World War II. It is not a film about the Holocaust per se but about how the war impacted ordinary citizens in a small working class German town where people were compelled to support the Nazi cause most likely without knowing about the concentration camps and the Nazi genocide. Like the book, the film is narrated by “Death” (voice of Roger Allam), though he is never identified as such. It is a risky device that could have been mawkish but, in the context of the film which is mainly geared to young adults, provides some humor and softens the disturbing events seen on the screen. 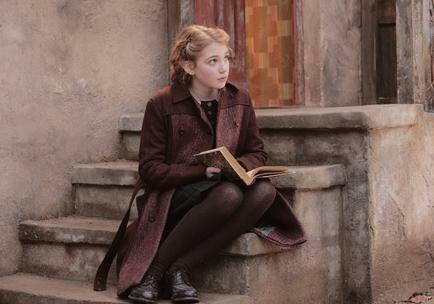 Liesel Meminger, in a superb performance by French-Canadian actress Sophie Nélisse (“Monsieur Lazhar“), is a young girl of eleven who is adopted by surrogate parents after her mother, ostensibly a Communist, abandons her for unstated reasons, though they can be easily guessed. The family was also expecting Liesel’s younger brother but, sadly, he died of an unexplained cause during their long train ride. Liesel’s new foster parents, the Hubermanns, are very different from each other. Hans (Geoffrey Rush), a housepainter who has refused to join the Nazi Party and has suffered economically for it, is warmer and more immediately accepting than his wife Rosa (Emily Watson), who appears cold and brusque. As the political climate worsens, the family observes the Kristallnacht (Night of Broken Glass), a state-approved violent outburst in November, 1938 against Jewish businesses and synagogues in both Germany and Austria, an event that resulted in the murder of hundreds and the forced deportation of 300,000 German Jews to concentration camps. Upset at the taunting she has to endure at school because of her illiteracy, Hans, who plays the accordion to stay calm, begins to teach Liesel to read, using the basement walls as a blackboard. Studying the only book she has, The Grave Digger’s Handbook which she stole at her brother’s funeral, stimulates in her a passion for reading. After seeing Liesel save a book from the fire after a Nazi book-burning ceremony, the burgomaster’s wife, Ilsa Hermann (Barbara Auer) who Liesel works for as a laundress, invites her into her home to see the vast library put together by her now deceased son. Her visits become an important part of her life until she is thrown out by Ilsa’s fanatical husband, losing an important source of income in the process. A new avenue is opened for learning, however, when Hans allows Max (Ben Schnetzer) to hide out in their basement, repaying a debt owed to the boy’s father for saving his life during World War I. As Max lies ill, recuperating from his injuries, Liesel reads to him from books that she takes from Ilsa’s library. In reciprocation, Max shows Liesel the path to becoming a writer by stimulating the use of her imagination. In addition to her relationship with Max, Liesel has also become friends with Rudy Steiner (Nico Liersch) a fair haired German classmate who is ridiculed at school because of his admiration for the black track star, Jesse Owens, who won four gold medals at the 1936 Olympics. Though they both have to wear hated Nazi youth uniforms, they are aligned on their hatred of the Führer. Though John Williams score adds to the appeal of The Book Thief, Percival avoids the temptation of heart-tugging sentimentality, allowing whatever tears are evoked by the film’s emotional climax to be fully earned. 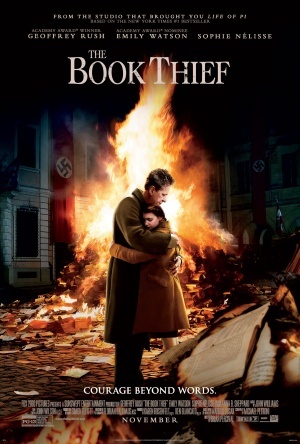 Contrary to the specious arguments of some critics that The Book Thief is “Disneyfied” and makes light of the Nazi crimes, it is a perfect film for young people to learn about the dangers of an authoritarian government and to appreciate the value of the written word and the importance of culture and knowledge in a civilized society. I hated “The Reader” for its tackiness with the subject matter and I get the same hollow feeling in my stomach when I look at this. The Academy should eat it up though. So I take it you haven’t seen it? Nothing tacky about it. I haven’t. My comment was based off of first impressions.